Back in 1984, we were two moms living next door to each other in the little town of Delaware, Ohio. Since our kids were still little, we were looking for a way to do what we loved and stay home with them too. We had always shared a love of home cooking and making memories with family & friends and so, after many a conversation over the backyard fence, Gooseberry Patch was born. We put together our first catalog at our kitchen tables and from that very first mailing, we found an immediate connection with our customers. It wasn’t long before we began receiving letters, photos and recipes from these new friends. In 1992, we published our very first cookbook, compiled from hundreds of these recipes and, the rest, as they say, is history. 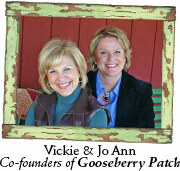 In addition to our nationally bestselling cookbooks, we've expanded Gooseberry Patch to include a very special email magazine, delivered one page at a time. It's filled with handpicked recipes, inspiration and products, just like the ones found in our original mail-order catalog. Be sure to subscribe to our emails, if you haven't already. Whether you’ve been with us since the beginning or are just discovering us, we're so glad you're a part of the Gooseberry Patch family! P.S. Don't miss our newest cookbooks!